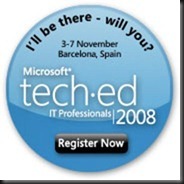 I’m off to Barcelona for this years TechEd IT Pro in Barcelona starting on the 3rd November. I’m not getting there until the Tuesday due to another trip but more details on that later. I’m really excited as this will be my first proper Microsoft conference that I have been to, my first conference aboard and my first as a MVP. Let me know if your attending. It would be great to meet up.